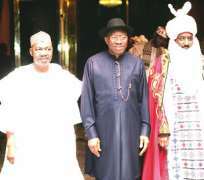 The new Emir of Kano, Muhammad Sanusi II, on Thursday paid a surprise courtesy visit to President Goodluck Jonathan. The erstwhile governor of the Central Bank of Nigeria met behind closed doors with the President at the Villa. When he left the meeting, Sanusi did not speak with journalists who approached him for comments. The relationship between Jonathan and Sanusi became strained when the President suspended him as the governor of the Central Bank of Nigeria. Jonathan had suspended Sanusi as the apex bank's boss over what was described as financial recklessness. Since his appointment as Emir, Thursday was the first time Sanusi would be visiting the President alone, although he was one of the Northern Traditional Rulers who joined Jonathan in the Presidential Villa, Abuja, for the breaking of Ramadan fast on July 23.